30 December 2016 ― $25 sent via PayPal to confirm a buy-one-get-one-free offer for air travel not to exceed $200 that can include destinations like London, Paris, Honolulu. Okay, it can exceed $200 if I want peak times. Must depart on Monday or Tuesday. Must pick three dates and destinations in the coming year starting months from now and with a minimum 30 days between each other. They’ll get back to me 60-90 days prior to what would/could be the date of departure to discuss my options. But that clock only starts after I mail in a signed form and a cashier’s check with a deposit for $100. This all started when I received a phonecall from Dynasty Travel Solutions stating that I had already paid for half of a trip package but hadn’t followed through. I did recall something about a collection of trips — a cruise, a hotel resort, a condo stay — discussed by phone some years ago. Life took me elsewhere. Now the subject returns in the form of a ‘new improved’ offer with a vast array of destination choices that didn’t limit me to Florida and the Bahamas. So I listened. I asked where they were calling from. California this time. I prodded for the best deal they could offer. They lowered the price. I bit. A sum of $399 got me back in the game for the three trips called the “Dynasty USA Getaway” (that now includes international destinations). The call was connected to a third party to issue an audio-recorded receipt and a transaction ID. Then thanks to a little resistance on my part, they tossed in this companion airfare deal that I am documenting here as I take the steps toward what sounds like huge savings. Getting to this point first required going to activatecertificate.com/redeem with a certificate code provided by snailmail from return address “Dynasty Travel Solution” (no “s”) postmarked Dec. 20, 2016, in Margate, Florida, to my home address. A one-page “Welcome Aboard” itemizes my trip packages (along with others not included in my deal) as well as the companion airfare offer. A second sheet prompts me to redeem that airfare certificate online. There I paid $25 via PayPal and received a PayPal receipt with the merchant’s name “Certs Etc.” and the contact email customerservice@hotelsetc.com. I then got a thank-you from “Electronic Incentives” sending me to rewardregistrationcenter.com, ultimately to be sent to that same reward registration site three times to continue providing increasingly detailed personal information, the third of which was to set dates and destinations. A thank-you came from IIGNet.comand IIG Promotions in Lake Havasu City, Arizona, where I’ll be sending $100 in cashier’s check or money order. I trekked to the bank on New Year’s Eve to get a cashier’s check for $100 to accompany the signed form with my three choices of dates and destinations. Deadline January 19, 2017. So far I’ve spent $399 for the three trips (unrelated to this airfare deal) and now $125 for the airfare deal that may or may not work out. Fingers crossed…. Every day since registering my companion airfare certificate and paying $25, I’ve received a form letter via email prompting me to send $100 by Jan. 19 to initiate the airfare purchase to one of my selected destinations. I finally complained about the constant emails by replying to one of them. Debbie from IIG wrote back right away stating that it was a glitch and that such persistent reminders aren’t supposed to be going out. She said she would contact IT about my case and one other like it. She followed up, “And, just to double check, you did send a signed copy of that form with your deposit check?” Yes. I did. Yet I continue to receive that letter from customersupport@iignet.com. Reading a thoughtful response from Dynasty Travel Solutions to a couple of online complaints posted on a scam report site, I was emboldened. “Yes we are a legitimate company,” wrote Chief Financial Adviser William Sams on 15 Nov. 2016. “We are registered on Sunbiz.org as a legitimate travel company along with documentation for a seller of travel and licensing.” Addressing two reviewers by name, Sams explained that any delay in responsiveness was due to a tropical storm that knocked out the phone lines and internet. It happens. However, my call to Mr. Sams days before this writing was not returned, even though I left a message stating that my travel companions and I needed critical details on the accommodations and were eager to book one of the vacation packages included in my original purchase. I appreciate his lengthy account of the steps taken to satisfy one of the individual writing the negative reviews — including a full refund and an offer of complimentary travel. But to me he never responded. I also failed to get through to a person at the main toll-free number supplied on the Dynasty website and in email correspondence (877.545.5814) — a number that shifts to music immediately after the call connects. Every time I called, there was a long music hold, then a recorded voice would come on asking the caller to leave a message. But granted, this was all during the holiday season. Some companies handle that more gracefully than others. The only paper mailing so far received was the colorful “Welcome Aboard” flyer signed by Sams with his name, email address and phone number along the one-page certificate for my companion airfare. So while my money order for $100 makes its way to Lake Havasu City, AZ, to take advantage of the cheap flights for two, I’m still curious about my travel options on these two vacations (one condo stay; one hotel resort) and a cruise. My husband and I really do have travel companions waiting for our deal details for travel we’re planning together. This time after the music played for a very short time, I heard the clear voice of an American man named Jeff Newkirk. He spelled out with patience and clarity the differences between my 8-day/7-night condo vacation and the 4-day/3-night resort hotel stay, even supplying the name of the company that would ultimately book that eight-day trip. 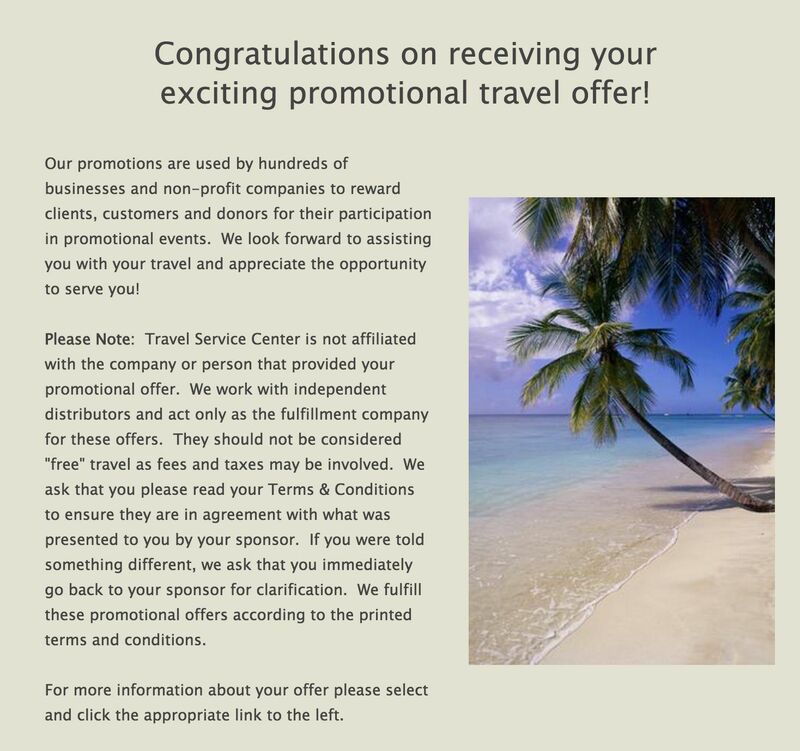 That company is in Tampa and can be found at TravelPromotionsFAQ.com. Newkirk supplied a person’s name and phone number for that company in Tampa, but he instructed me to begin the process with him at Atlantic Travel Services in Ft. Lauderdale. In both cases, a voucher would be issued, then I could move to booking the lodging. But the kick-off, he said, should really be the four-day trip that requires sitting through a 90-minute presentation. This was the first I had heard of a sales pitch as part of the deal. But I’m game. Newkirk explained that the vacation I purchased is “a promotional travel product rather than a retail travel product,” and therefore would “require a little bit more participation on [my] part.” I’ve sat through a timeshare pitch. It can be aggressive, but it does end, and vacation continues apace at a surprisingly affordable price. So he and I proceeded to try and book something for the upcoming three-day weekend in January, only eight days away, despite everything in the literature requiring much more advance notice. He even went online to see what flights would cost to various destinations from Chicago. Alas, most places on his list would be costly to fly to on such short notice and during a federal holiday weekend, and most Dynasty-affiliated accommodations wouldn’t be possible to book anyway without more advance planning, each accommodation having its own terms. Hotel taxes and “fees” would apply in various amounts according to destination. The one location that’s easily drivable from Chicago and only required seven days was Wisconsin Dells, the “waterpark capital of the world.” I declined. My sense is that South Florida is the company’s preferred area, and Newkirk did push for it. But other getaways include Charleston, Hilton Head, Williamsburg, Branson, Las Vegas, the Bahamas, eastern Canada and several destinations in Mexico. There are about 20 in all. So I’m saving my hotel resort vacation for another time, but now I know what it’s like talking to someone on the phone about this travel package. I let Newkirk know that I would be publishing all about my experience in this ongoing report. Meanwhile, I wait to see what they’ll give me of the three dates and destinations I selected for the companion flight deal. And what kind of fares will they offer on a discounted two-for-one that has cost me $125 so far?